System-wide network outage cripples United Airlines passengers across U.S.
Thousands were stuck in line in Newark airport Tuesday afternoon, after United Airlines experienced a system-wide computer outage. Thousands of United Airlines passengers are experiencing flight delays and long lines nationwide after the system-wide network outage took the airline offline for at least two hours on Tuesday. The Chicago-based airline confirmed the computer troubles on their official Twitter and Facebook pages Tuesday afternoon: "We have a network outage and are working to get systems back online. We'll update soon." The FAA had ground stops for in-bound United flights at Newark, San Francisco and Houston airports, but it was later lifted. "UAL's computer went down," the Federal Aviation Administration said in a statement. "It's back up ... but the delays we're seeing are absolutely a United problem, not an ATC (air traffic control) issue." 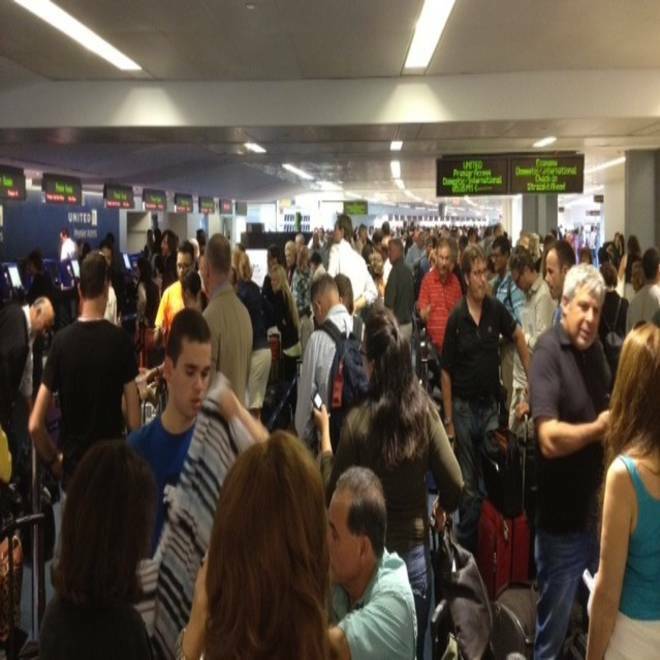 Thousands of passengers were stuck in line at Newark Liberty International Airport Tuesday afternoon, according to NBC News' Jason White, who was among the mass of travelers waiting in line. The outage of the "SHARES" system affects things like reservations, ticketing and check-ins, which is critical for boarding passengers. The system is carried over from Continental Airlines. United adopted the reservation platform on March 3. The airline's website was also down for a temporary period, but is now running again. In a statement, United Airlines said it "is in the process of resuming normal operations following a temporary network outage that affected its airports and website Tuesday afternoon." The carrier said it "apologizes for the disruption caused to travelers at affected airports," and is allowing customers on affected flights to cancel or rebook their itineraries without penalty.